Be the first to share your favorite memory, photo or story of Arlis. This memorial page is dedicated for family, friends and future generations to celebrate the life of their loved one. Funeral services for Arlis Russell, age 82, of Buffalo have been set for 10 A.M. on Tuesday, July 31, 2018 at Bethel Baptist Church in Buffalo. A time of visitation will be held at the church from 9 A.M. to 10 A.M. before the service. Rev. Steve Brumbelow and Rev. Ray Grissett will officiate and burial will follow in the Buffalo City Cemetery. Arrangements are under the direction of Walter’s Buffalo Funeral Home. Arlis Leeman Russell was born in Huntington, Texas on December 19, 1935. His parents were Charlie and Ollie (Moncrief) Russell. He retired from Brown and Root after 30 years and had lived in Buffalo for the past ten years. Arlis enjoyed fishing, hunting and wood working. He loved to cook with his wife Wanda. 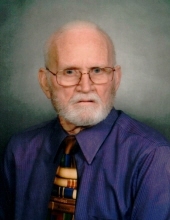 He was active in his church, Bethel Baptist, and served as a Deacon and Sunday School Teacher. Arlis was preceded in death by his wife, Wanda; by both of his parents and by a sister, Charlie Dee Allen. Surviving family includes son, Arlis Russell, Jr. (Becky) of Houston; son, Kelvin Russell (Monica) of Spring, Texas; daughter, Rhonda Hargis (Mark) of Teague, Texas; brother, Gerald Russell (Mary Ann) of Houston; grandchildren, Arlis L. Russell, III, Richard Russell, Stewart Russell, Brandy Robbins, John Inman, Colleen Collette, Laura Hargis and Daniel Hargis and great grandchildren, Maycie Inman, Reagan Inman, Easton Inman, Jackson Robbins, Benton Russell, Emma Hudson and Colton Collette. Serving as pallbearers: Arlis Russell III, Richard Russell, Stewart Russell, John Inman, Jackson Robbins and Daniel Hargis. In lieu of flowers, the Russell Family requests that memorials be made to Bethel Baptist Church. To send flowers or a remembrance gift to the family of Arlis Leeman Russell, please visit our Tribute Store. "Email Address" would like to share the life celebration of Arlis Leeman Russell. Click on the "link" to go to share a favorite memory or leave a condolence message for the family.